FANTASTIC RARE PAIR - ARTS & CRAFTS - AMAZING DESIGN. These beautiful ARTS & CRAFTS WINDOWS have outlived the original frames and have been reframed in new pine frames. Removed from a property in CAMBRIDGE during refurbishment CIRCA 1900. Windows of outstanding beauty with exceptional coloured & textured glass. FABULOUS SHADES OF GOLD - COBALT BLUE - GREEN - RUBY RED ABSOLUTELY FANTASTIC WINDOWS. The leads & Glass are in excellent condition. 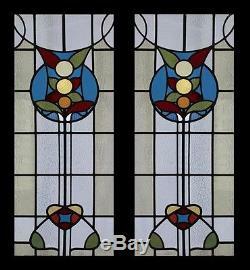 The item "Amazing Rare English Antique Arts And Crafts Pair Stained Glass Windows" is in sale since Wednesday, February 15, 2012. This item is in the category "Antiques\Architectural & Garden\Stained Glass Windows\1900-1940". The seller is "easyboo" and is located in WEST YORKS.